"One of the greatest inspirations for working writers is the writing of others that [sic] they admire. Walt Whitman and Homer, Dante, Shakespeare." The term "cliffhanger" may have originated from the serialization of Thomas Hardy's "A Pair of Blue Eyes”: One episode ended with a character literally hanging off a cliff. However, we can find audiences left hanging, figuratively speaking, as far back as Ancient Greece, namely in the epic poem "The Odyssey" attributed to Home (though authorship is hotly debated). 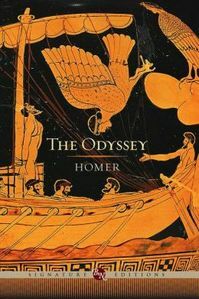 "The Odyssey" is known as Odysseus' story, and much of the plot indeed follows his toils and troubles attempting to get home to Ithaca after the Trojan War. But he doesn't appear in the story until Book 5, about 75 pages into a 400-ish page book (depending on the edition). The first four books belong to Telemachus, Odysseys' son, who goes on a mini-odyssey of his own in search of his father's fate. It’s a bit nerve-wracking, for modern readers anyway, wondering what’s happening to Odysseus and when we’re going to pick up his story. Amidst the chaos and the suitors' abuse, Telemachus, aided by Athena, slips out of town to seek his father's fate. He travels to the kingdoms of two of his dad's war buddies, Nestor in Pylos and Menelaus in Sparta. Meantime, back in Ithaca, the suitors plot to kill Telemachus when he returns. Here's the last line of Book 4 in Robert Fagles' translation: "Here the Achaeans lurked in ambush for the prince." He's not hanging off a cliff, but Book 5 takes up Odysseus' story, and we don't return to Telemachus until 10 books later. Besides this overarching cliffhanger, the story overflows with moments of tension and foreboding from chapter to chapter. If you want an object lesson in crafting suspense, you could do much worse than Homer. And judging from the reams of stories written in conversation with both "The Iliad" (which is also referenced in the Gilmore Girls series) and "The Odyssey," I’d have to agree with Max. Great writing can inspire more great writing. Now go read "The Odyssey"!